Small in size and light in weight, you can take the grill to your outdoor parties easily. The lid has glass reinforced nylon handle which prevents it from getting too hot and the lid can be removed without any burns. The cooking grate, measuring 14-1/2 inches in diameter, is ample to cook for multiple people and is triple nickel plated for durability and long lasting life. The grill parts are coated with porcelain enamel to avoid rusting and corrosion. The product has a 10 year limited warranty. The grill is very compact and light weight. You can carry it around with you wherever you go. It will fit in your luggage. After you are done using it, you can easily store it away. The small size also means it is easy to clean. The legs of the grill have a sturdy design and are manufactured with superior quality material to prevent any wobbling while you are using. 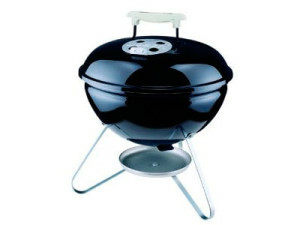 Excellent quality construction of the grill provides users with durability, long lasting life and the best tasting food. The design of the lid and bowl evenly distributes the heat, so you get the right temperature. Plus, it requires a limited supply of coal to cook, so you can save on those expenses. The grill features vents on hood and on bottom to make the users able to adjust the flame and avoid flare ups. Because of its compact nature, some users might find it difficult to cook many items simultaneously and it might seem crammed. Users might experience that the bottom vent clogs with ashes, creating problems with ventilation and air flow to control the flames of the coals. This might also lead to difficulties in keeping a steady flow of heat to the food while cooking. As the lid has to be completely removed, users can’t use it as a shield against wind. So any breeze blowing might disturb the flames and smoke. Some users might feel that the grill rusts too soon, and that might affect the look and taste of food you cook. Weber Smokey Joe Grills is recommended for individuals who want a small sized grill while travelling, which has most of the features of full sized grills. It is ideal if you want to save the time and effort needed to start a big grill to cook a few items. Use it with good care, and it will last long.